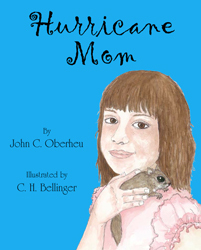 Hurricane Mom is the heart-warming story of a young flying squirrel that loses its home and family during Hurricane Ivan. People were not the only victims of this terrible, destructive storm. A caring young lady rescues the cold, wet and hungry orphan, raises her, and helps her return to the wild. Only a year later, the young squirrel faces a new hurricane threat. Southern flying squirrels are found in forests of all the eastern U.S. Though not rare, they are night creatures that are seldom seen during daylight hours. Their nests are hidden in trees, and most children have never seen or heard of them. Readers will learn many interesting facts about this little-known animal. Although the story is fiction, it is based on true-to-life biology and events. Three persons who actually raised young flying squirrels have reviewed it for realism.